Origin and Habitat: Tillandsia ixioides is widely distributed, in Bolivia, Paraguay, Uruguay, and Argentina. Altitude range: From near sea level to almost 2,400 meters. Habitat and ecology: This species, a self-incompatible, hummingbird-pollinated bromeliad, grows in mostly dry, woody forest and thorn bushes. This small, grey-leaved species is easily artificially propagated. Nevertheless, the natural populations of T. Ixioides are still exploited by Argentine commercial collectors. Description: Tillandsia ixioides is a smallish epiphyte (tree-dwelling) plant that forms rosettes of erect, very stiff, silver leaves growing in a symmetrical rosette. It has pendent canary-yellows flower when it blooms which is not common. Once the plant flowers it dies, but before it dies it produces small plantlets, or "pups", at the base that replace the mother plant. This method of reproduction often results in large clumps of hundreds of plants the size of which can be over a meter in diameter! The rosettes hold onto trees via anchoring roots. Leaves: Erect, pointed, narrow-lanceolate, channeled, 7 to 15 cm long, densely covered with white scales on both sides that collect water and nutrients for the plants. Leaves are brittle and can may break off at minimal impact. Flowers: Ten or fewer bright-yellow, three petaled flowers are borne on a spike that terminate an about 8-cm-long stem emerging from the plant's center. Fruits: Capsules filled with seeds tipped with white plumes. Similar species: Tillandsia didisticha, Tillandsia meridionalis, Tillandsia concolor. 3) Gouda, E.J. (2010) "Eine neue Kombination und eine neuer Status bei Tillandsia ixioides." Die Bromelie. 2010(2):76-79. Deutche Bromelien Gesellschaft. Cultivation and Propagation: Tillandsia caput-medusae is a slow-growing variety and perhaps one of the mainstays in most everyone's collection, requiring bright light and controlled watering to prevent constant wetness. It is drought tolerant, and will thrive within a broad latitude of care conditions, but it rots more easily than many of the others. One way to avoid this, as with these other similar types, is to grow it mounted or hanging sideways to upside down. In this manner, no water will be able to collect in the base of the plant, something that can initiate the rotting process. Outdoors grow the air plant nestled in the highest reaches of a tree where it will receive very bright light and excellent air circulation. Soil: It is exclusively epiphyte, which means it naturally grows on trees and needs no soil or transplanting. Watering: It takes in all of the water and nutrients it needs from the air so it should not be watered as frequently as other airplants. Just like for carnivorous plants, water them with rainwater or demineralized water. You can mist the leaves once or twice weekly depending on the humidity levels in the greenhouse (or even daily during the hotter part of summer), and make sure the plant gets dry quickly, whilst in winter with low temperatures it is better to leave it quite dry for avoiding possible rottenness. The plants in nature are extremely drought tolerant. Propagation: Division or seed. It is easily propagated by removal of offsets at any time of the year. The plantlets must be hung on bark slabs. In the greenhouse you can attach the offsets to slabs of oak wood with small staples holding the roots on the wood until they attach themselves. This can also be done with a small patch of hot glue (just not too hot) to hold the plants in place. Around the base you can use some reindeer moss to cover the roots and to hold moisture. 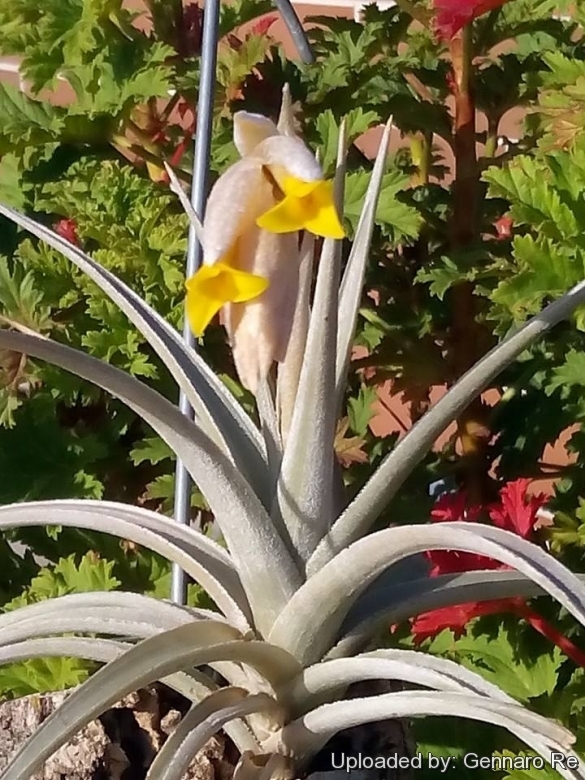 Pups are produced after blooming, as is usual with most Tillandsia species. Seeds are germinated on peat moss. Seeds need light to germinate. One easy way to tell apart plant raised from seeds or division is to look at the plant. While not always the case, generally it is true that if the leaves are relatively straight and short and there are no roots the plant is an offset taken from a mother plant. If the converse is true, that is, the leaves are long and curving and there is a root system present, then this plant will be a number of years old and grown from a seed.